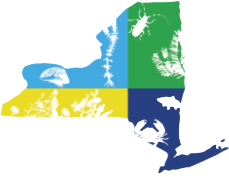 NYISRI works closely with other partners in New York State’s invasive species initiatives, including Cornell Cooperative Extension, the Invasive Species Clearinghouse, the Partnerships for Regional Invasive Species Management (PRISMs), and the NY Natural Heritage Program. Check out the Web resources provided by these partners on our Partners Page. See our Funding Opportunities page for a list of grant and RFP programs. Find webinars, podcasts, and other invasive species resources on our Media Page.